I guess this is life. Maybe, strange things happen without much meaning. The number of strange things happening around Oliver is pretty large. So, hundreds of years ago, Merlin put himself in a suspended animation of sorts, and hid his body behind some clever little puzzle — like a video game. Wizards have made a few attempts to find him, but they haven’t worked out (obviously). The last attempt ended in death, destruction and betrayal. More than a decade later, it’s time for another shot — one last shot. Merlin’s last male descendant, Oliver (although I’m not really sure about the math on that — sure, he’s a dork and awkward with females, but there’s no reason to think that Oliver couldn’t have kids). Oliver has no clue that he’s a Wizard (I guess the owl from Hogwarts got lost), his mother’s memory has been magically wiped, so she has no clue, either. Oliver’s kidnapped (for his own good) and whisked away to begin to learn about his heritage while being introduced to a world of elves, witches, trolls, goblins, demons, seraphs and more. Most of whom are on the verge of war with each other, and only Merlin can stop it. Oliver, a mind-reading goblin, a couple of attractive adolescent witches (he’s a 15-year-old nerd, of course that’s how he categorizes them), and an old friend of his father are the key to bringing back Merlin and saving the world. This isn’t your typical Merlin — or your typical anything — beyond the very typical socially awkward teenage male protagonist. The plot, on the whole, was so-so. It got the job done, but never really grabbed me. The characters were . . . all right. Nothing special, nothing we haven’t seen before, but nothing eye-roll inducing or annoying. The world-building was very detailed, intriguing, and impressive — although sometime it wasn’t explained clearly. Still, if anything would bring me back for a second novel, it’d be the world-building. I don’t think the chapters of Goblins speaking to Goblins were anywhere near as funny as Lovato seemed to think they were, but I admire the fact that he stuck with them for as long as he did. There were a few quirks that caught my eye — each race’s magic is characterized by a color, and Lovato spends a lot of time talking about them — so much so that I wondered if Hal Jordan and the Guardians of Oa were going to show up. I’m not sure I remember reading anything where the hero gets knocked out so often — it’s worse than Daredevil, Season 1. It’s not a huge thing, but there’s a difference between someone being a novice/rookie and someone being pathetically helpless. Reduce the knock-outs by 20% and I probably wouldn’t say anything. My main complaint was the language — a few idiomatic phrases were off, the dialogue was frequently stilted, a lot of the word choices were not wrong, but certainly not right. About halfway through the book, I skipped ahead and read about the author — the fact that he’s a non-native English speaker explained just about every problem I had with the mechanics of the writing and I was able to ignore them. That’s precisely how it reads, and if I’d known that going in, I’d probably have enjoyed the whole experience a little more. Still, far too often Lovato uses three words when one would do. Not a great book, but an entertaining read — and at the end of the day, that’s enough. For a little atypical YA fantasy, this would be well worth a look. Disclaimer: I received this book from the author in exchange for this post, the honest thoughts contained above, and participation in the Book Tour. 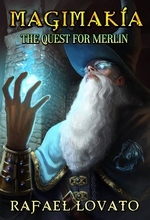 Magimakía – the quest for Merlin is the first book of a contemporary fantasy series for Young Adults that explores the universe of RPG and MMORPG. In it, Oliver, a naive young virgin bullied 15 year old boy, without any knowledge of magic, trying to find the mage Merlin and save the Order of Mages and Witches of undoubted extinction, ends his journey victim of a magnificent and at the same time terrible event. From a young age I always wanted to write a fantasy novel, because of my experience with (MMO)RPG games like Diablo and World of Warcraft. The magical universe, the battles and the powerful characters fascinated me. But writing a fantasy book is not something simple. So, after five books published and feeling capable of a foray into this universe, I finally wrote Magimakía – The search for Merlin. The first step was to choose about what would be the story, and what kind of races and powers I would use in it. Since I always liked fantasy movies, and there was no way for me to escape this influence, I took Tolkien’s idea of introducing demons as non-religious entities (from ​​Lord of the Rings, the battle between Gandalf and the Balrog). Alongside the demons, I brought angels, who resemble paladins, also not religious, and mages, witches, elves, trolls and goblins. Regarding the writing itself, to construct the history I used the Hollywood structure, with the characteristics turning points structure (10%, 25%, 50%, 75% and 95%). Also, took great care to develop the “arc of the characters”, and build well-marked voices for the three book narratives: Benjamin, goblins and Oliver. The scenes and sequels respect the international structure (Scene: objective, obstacle and disaster; sequel: reaction dilemma and decision), and wrote the entire text within the MRU’s technique (motivation and reaction units). The story itself respects the dynamics of the RPG universe, with close attention to powers mathematics. This means that all races powers are balanced, as well as the most powerful entities. To a careful analysis, you can identify that in the mechanics of battles there are warriors, generals, mini-bosses, bosses, and world bosses. This engine respects the dynamics of RPG games, to appeal to the book’s target audience, who are young adult video-gamers aged 12 to 25 (and adults too, of course). The book was originally written in Portuguese and published in Brazil by Editora Zap Book (eBook and print) and in Portugal by Editora Chiado (print and eBook), both in June/15. Availing the fact that I speak English fluently, I wrote the English version of the book, and introduced it to a US editor, for editing. I was fortunate to present the manuscript to Ravenswood, who did not hesitate to offer me a publishing contract. About myself, I am a well-established Brazilian author with six books commercially published, being Magimakía – the quest for Merlin the latest. Recently the Oxford University Press bought a short story of my to use in their courseware as writing model for fiction short stories, already published in the book Portuguese language for 6th grade, by Oxford. Magimakía already is the best-selling book of my Brazilian Publisher, which is starting a national advertising campaign of the book. Welcome to our Book Tour stop for The Quest for Merlin: Magimakía. In addition to this blurb about the book and author, I’ve got a a Guest Post from Rafael Lovato about the life of this book up to this point and my 2¢ about the book. Follow Oliver’s journey, a skinny, naive 15 year old boy who knows nothing about magic, let alone how to survive high school as a bullied and outcast teen, as he attempts to help save the Order of Mages from destined extinction. Kidnapped by a midget goblin and his troll cohorts, Oliver’s only hope is to learn the whereabouts of the all powerful Merlin who has been missing for over 500 years. With the help of two witches, Avery and Violet, Oliver begins his journey in a world full of potions, spells, and bubbling cauldrons, learning a lot about witchcraft and magic. You will be spellbound as you are transported into this amazing landscape where anything could happen, as tragic events unfold that could keep Oliver from saving Merlin and the entire world of Mages and Witches! One Liner: Magimakía – the Quest for Merlin is the first book of a contemporary fantasy series for young adults that explores the universe of RPG and MMORPG where a naive, bullied 15 year old boy, without any knowledge of magic, tries to find the mage Merlin and save the Order of Mages and Witches from destined extinction. Rafael Lovato is a Brazilian author with six books published commercially in Brazil, and one in Portugal, Magimakía, a busca por Merlin. This is his first book published in the US. 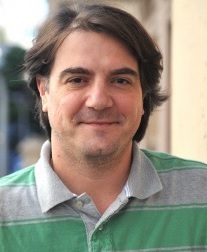 In 2014, the prestigious Oxford University Press bought one of his award-winning short story to use in their courseware as writing model to teach students, already published in the book Portuguese language for 6th Grade, by Oxford.